Consistency is the name of the game in the restaurant business, and when it comes to that, Choko La hits the nail right on its head. At least that is true in their dessert and bakery department, as for the last few years I have been frequently buying pastries, cakes, cookies, breads and the likes from them and each and every time have been satisfied to the brim. Choko La is situated at the Galleria Market in Gurgaon, and while it doesn’t have a lot of sitting space, there is a certain coziness that one feels on entering the restaurant. The place knows what it’s good at and sticks to it. This means that there have been very few changes to the menu over the years. Their Tiramisu pastry which can and has been bought as a 1KG cake as well is delicious and so is the traditional Black Forrest pastry, the Belgian Chocolate Truffle and the various cupcakes that they make. The good thing about the assortment of sweets that Choko La serves is that one never feels “heavy” after consuming them. They are rich no doubt, but this richness is primarily in the taste. I’ve always wanted to try their macaroons, but considering their small size, I have never been able to justify their price and thus they elude me till date. The price in general is on the slightly higher side and with most pastries coming in around the Rs. 125 mark per piece; my sweet obsession does prove to be costly. Then again, they always taste good, look gorgeous, feel fresh and from what I can make out, are made with quality ingredients, so the price is reasonable in most cases. Choko La also organizes special event cakes which once again have been habitual at my house for quite a few years now. They do keep a book with a vide variety of designs, but I have sometimes found it hard to get a cake in the 1-2Kg range as most will start at 2.5Kgs and then go on up depending on the occasion and what is required. Still, the cakes are amongst the best that are available in Gurgaon and usually priced around the Rs. 1200-1400 per kilogram range. 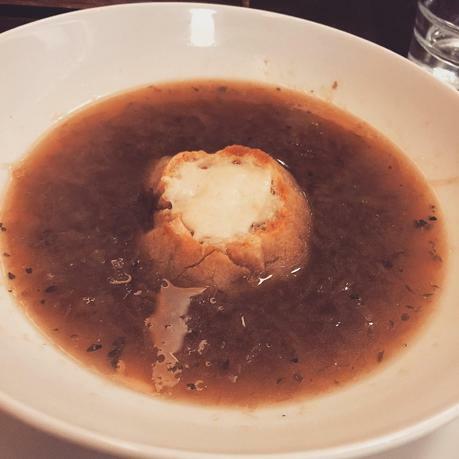 The French Onion Soup confused me. I still can’t make up my mind whether I liked it or not as it tasted just fine, but lacked a few key elements. The soup had bits of onion that were cooked to perfection giving it just the right taste. The seasoning was a bit bland, but as I always say, I’d rather add salt to my liking than have food served to me that is spicy. It should also be noted that this “blandness” allowed for the taste of the onions to come through and that should be the whole point of a French Onion Soup. Furthermore the soup lacked a certain thickness which then took away from its character in totality. But, the one thing that bothered me the most was the bread. It was just too small for the dish that the soup was served in. Either the soup should have been served in a smaller bowl or else a flatter, but larger, bread would be more appropriate for the overall look of the soup. 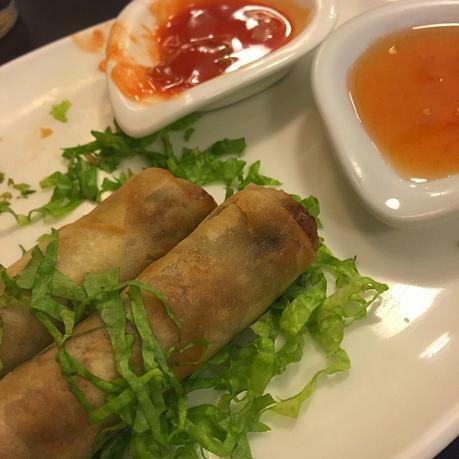 The Vegetable Spring Rolls on the other hand were perfect, nay, better than perfect. Crunchy on the outside and nice and warm on the side, the filling was green, clean and fresh. They were accompanied with “hot sauce” which once again hit the mark on the spot. The spring rolls turned out to be just the right snack to accompany a coffee and soup on a chilly winter afternoon. Now, when I do visit again, and I shall soon, my aim is to be brave enough to try their chocolate pizza. Yes! a chocolate pizza. If not that, then there are still other items I can try for the time being, but I’ve always got the cakes and pastries till then.